This is the best pub in the area for sunny lunchtime beers. 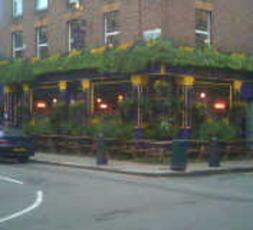 Its position at the end of the road means it isn't in the shadows and unlike the local Bree Louise or the Queens Head and Artichoke that also sit on the sunny side, the road it is on only sees cars once every 5 minutes+ so its ore outside drinking friendly. Also since it was done up 12months+ ago, the beer, food and service has certainly improved leaps and bounds. Back in 2010 I rated this a 3, now its a healthy 7. Good selection of bottled beers, they regularly change whats on tap. Serve burgers now, and have a hostel upstairs. Much better than when it was a scuzzy old mans pub.